Don Pedro Ixchop, head of the Association of Maya Ajq’ij offers a prayer at Lake Attitlan in April, 2017. 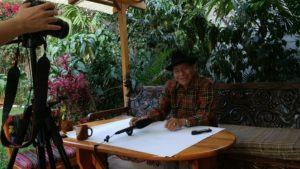 Don Pedro was gracious enough to join us, along with his son, for a day where we filmed him speaking on a number of topics, including the mathematics behind Maya knowledge, meaning of Ch’umil’al, numbers, and much more. Here is a rough translation of the prayer: Heart of the Sky and Heart of Mother Earth we thank you for being here today with my brothers and sisters. In this day we ask you Ajaw, Bitol, Tz’akol that you bless my brothers and sisters and bless us in our mission. We ask you with much humbleness, because you are the Ajaw, you are part of the air, part of the fire, you are in the Earth, you are in every place that exists in the four cardinal points of the Universe that you bless all the nations of the world. You are the powerful one who resides in the mind and the heart of every creature over the face of the Earth, don’t leave them or forget them Father, because they are also alive, because they also pray for the peace and calmness of the world. Thank you Ajaw, Heart of the Sky and Heart of Mother Earth. Tata Pedro Ixchop prayer from Saq’ Be’ on Vimeo.